Welcome to the seventh installment of Eyes on Milwaukee. This week the focus is all on City of Milwaukee elected officials following yesterday’s election. I explore the likelihood that Willie Hines runs for Mayor, how the new Common Council will resemble the old Common Council, the wide disparity in vote totals between districts, Bob Donovan winning the war, the shocking number of votes Johnny Thomas got, and Spencer Coggs’ new job. There’s no question that Common Council President Willie Hines, Jr. was considering a run for Mayor in 2010, predicated on the idea that Mayor Barrett would become Governor Barrett and Hines could win a special election. 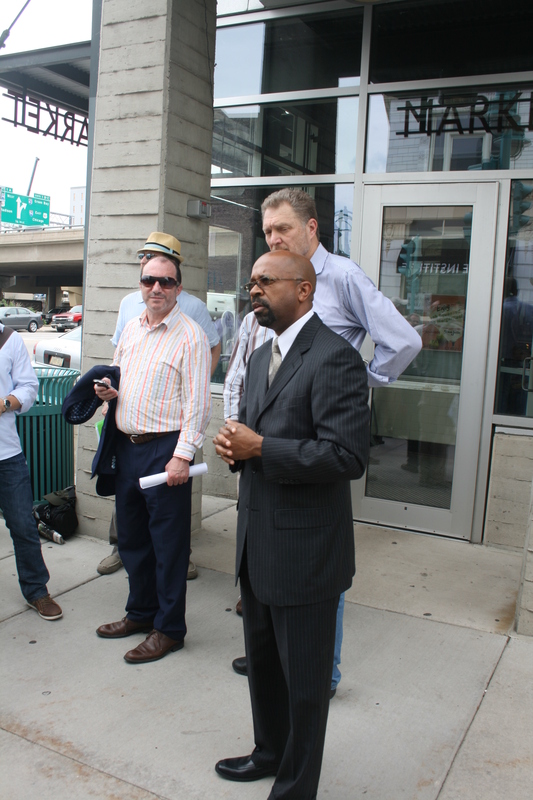 When Barrett lost in the general election, the talk of Hines throwing his hat in the ring for Mayor started to dry up, but not before Hines held a large, out-of-district fundraiser at Whiskey Bar on Jackson and Wells. Now that Mayor Barrett has officially thrown his hat back into the ring (for the third time) to become Governor, it seems likely that we will hear rumors about “Hines for Mayor” again. All of this is of course made all the more likely by the fact that Hines defeated challenger (and County Supervisor for less than one year) Eyon Biddle to retain his seat on the Milwaukee Common Council, and most likely his position as Council President. A lot stands in the way of Hines becoming Mayor at this point, but it’s something worth following. First up? Barrett needs to lock up the Democrat’s nomination for Governor in the recall election. Congratulations are in order for State Senator Spencer Coggs, the City of Milwaukee’s Treasurer Elect. Not only did the Democratic State Senator win a job that will net him a much shorter commute, he also now holds a job that pays $114,040, an amount he claims he was “shocked out of my socks” about. It is worth mentioning that the position of Treasurer was up for being converted from an elected position to an appointed one, less than a year ago, and to which the former top heads claimed would run fine without their presence. Outgoing Treasurer Wayne Whittow had held the post since 1976 (and previously served in the Wisconsin State Assembly), and all signs point to Coggs now being able to hold the seat as long as he would like. What Will Johnny Thomas’s Jury Look Like? One surprise out of the election results last night was the number of votes Johnny Thomas pulled in for Milwaukee Comptroller. Despite being charged with a felony for accepting a bribe, suspending his campaign for Comptroller, and being stripped of his Milwaukee County Board committee appointments, first-term Supervisor Johnny Thomas still managed to bring in 34% of the votes (18,457) in the Comptroller race yesterday. Thomas, who accepted an envelope filled with $500 cash from another Milwaukee County employee at Dunkin’ Donuts new location on West Wisconsin Avenue in December. Had he won, Thomas could have assumed the office of City of Milwaukee Comptroller, and it appears that without this whole felony bribery thing lingering, he would have won in a landslide. Thomas’s ability to draw more than 33% of the vote indicates one of the following possibilities is true, the influence of the media (of all mediums) is declining, there was a belief by a large number of voters that he’s innocent, or he has an usually high amount of name recognition for a first-time Supervisor. Assuming the case goes to trial, it will be interesting if any of the potential jurors are excused for voting for Thomas in the Milwaukee Comptroller race. If you’re grown comfortable over the past four years with the Milwaukee Common Council, you can likely rest easy about the next four. Voters re-elected 14 (out of 15) Common Council members, with the only change happening in Walker’s Point with incumbent James Witkowiak falling to Jose Perez. Witkowiak, likely much to his own displeasure, has now established a pattern of winning two elections in a row, and then losing the third. Being first elected in 1992, re-elected in 1996, losing in 2000, being elected again in 2004, re-elected in 2008, and now falling short in the Common Council’s closest 2012 race. Witkowiak chaired the powerful Zoning, Neighborhoods & Development Committee during his past term (a post previously held by former Alderman Michael D’Amato, who represented the East Side and Riverwest), and his departure leaves open a fairly significant post in the Common Council hierarchy. Being that it is rare for an Alderman to hold two chairmanships (last done by D’Amato likely as a result of Hines’ rise to President), who is the likely next Chair of ZND? All signs point to Alderman and Milwaukee Bucks season ticket holder Willie Wade. Wade is currently the Vice Chair of ZND, and also serves on the Community and Economic Development Committee. Who are the other likely ZND chairs? The Common Council’s most senior Alderman Michael Murphy (who trounced his opponent, Richard Geldon, by a 4-1 margin for the second time in a row) seems likely to stay put as Chair of the Finance and Personal Committee. The other likely candidate for the job, Alderman Bob Bauman seems likely to maintain his Chairmanship of the Public Works Committee. Jim Witkowiak’s departure leaves open one slot on the Zoning, Neighborhoods & Development Committee. Given that Council newcomers seem to often enough end up on Licenses Committee (and are therefore subject to its marathon hearings), it is likely that Perez will not end up on ZND at this point. My guess for the newest member of ZND goes to Alderman Nik Kovac, who is entering his second term on the Common Council and represents the East Side, Riverwest, and the north side of Downtown (an Aldermanic District that sees a significant number of proposals come before ZND). As far as the Milwaukee Streetcar project goes, the project appears set to remain on track at the Common Council level. Jim Witkowiak was a supporter of the project and had voted in favor of the project in the past. It remains to be seen if Alderman-Elect Perez will continue that support, but he hadn’t campaigned against it. Alderman Robert Donovan held onto his seat on the Milwaukee Common Council by a wide margin following yesterday’s election. Donovan defeated challenger Ben Juarez by over 500 votes, registering 60.5% of the vote total (1,463). As discussed last week’s “War on Donovan” section, the Juarez campaign had increasingly focused on Donovan’s 20-year-old disorderly conduct ticket. Those in the district have spoken with their ballots, and it appears that issue alone isn’t enough for them to replace Bob Donovan. Voter turnout in Milwaukee’s various Common Council districts is disturbingly varied. Looking only at the competitive Milwaukee Common Council races, the vote totals for each candidate were as follows. Out of the four races I was following closely (8, 12, 14, 15), only one district, the 14th, had anything resembling a strong turnout. Jan Pierce, who failed to defeat incumbent Tony Zielinski, drew enough votes to beat Perez and Donovan combined. Two important takeaways I get from this. One, district by district the City of Milwaukee is not equal when it comes time to elect their local representative. Two, despite the wide disparities in vote totals, once the Alderman step foot inside Milwaukee City Hall they each get one vote. Third, if you want your vote to have as much influence as possible, move to Walker’s Point or elsewhere on the Near South Side. Nice article. Meaty, rich content to consider. Thanks for laying everything out. Not sure I’m ready to react myself — still lots to chew on — but I really appreciate Juli’s feedback. Also, I’m pretty sure I took that photo. I am pretty disgusted by some of the obvious race-baiting in certain county-board races, overall the election results feel very uninspired. Himes as the Mayor of Milwaukee will be the last nail in the coffin for this city.. It will go down in a ball of flames just like Detroit.. We’re sunk if that happens. @DG I’m curious why would you say that? @Nick Yeah… clearly some races got into the ugly territory. Dave great job! This is a great recap and I appreciate the historic perspective. In fact you gave me plenty to think about. Great article Jeramey. The district voting disparity is a great issue to focus on. The two highest voting totals above have the 2nd and 4th highest percentage of white voting age residents in the city. The two lowest are the two Hispanic-majority districts (http://city.milwaukee.gov/ImageLibrary/Groups/ccCouncil/2011-PDF/2012AldermanicDistrictDemo9-20.pdf). When I’m out and about telling folks that minorities don’t vote, I usually get a negative response. I’m sure the matter-of-fact delivery doesn’t help, but it’s an example of folks not wanting to hear the truth, because it’s the truth. One factor that I’ve heard of in regards to the low turnout in Hispanic districts is the amount of Hispanic residents who are not citizens. In fact, that was the central point of Voces’ state redistricting argument – that a relevant amount of the Hispanic voting age population is not eligible to vote because they are not citizens (they were arguing that the voting age population of a district needs to be higher than has been historically assumed for minority districts in order to guarantee that Hispanics would be able to elect the candidate of their choice). Also, there’s often the mistaken belief out there that people who have warrants, overdue parking tickets, suspended licenses and the like will get in trouble if they go in to vote, and minorities are disproportionately in this position. So there’s an education issue as well. But mainly, I think there’s just too much apathy among voters in general in regards to local politics, and this is especially true for minority voters. Our local political so-called leadership does not help in this area at all and often encourages the apathy as it keeps them earning a paycheck. Lastly, shout out to Juli for the great post! I agree with the implication that the County Board races were not even worth covering. The suburban referendums on downsizing/part-timing the County Board though (~85% in favor) – zut alors is that an indictment! @Jim Actually Jeramey has an article on the County topics hopefully coming today. Jan Pierce made a huge dent in the Tony Zielinski myth. It’s unfortunate that some voters were too afraid of change to really allow District 14 flourish. But the energy created is evident, and Jan and his team will continue to make an impact in the area, aldermanic office or not! @Nate Anyone who dares to run against the establishment here is tarred and feathered…ideas and ideology be damned. Case in point Willie Hines saying Eyon Biddle was “basically Scott Walker” for wanting to focus on job creation in his district. @Nick I’m curious as to what that entire Hines quote said. I hear you Nick, beating incumbents is almost impossible, with little regard to the quality of the incumbent. Nate, I think the fact that Jan Pierce came as close as he did close to Tony Zielinski despite the massive disadvantage in resources–financial (Zielinski started with ~$137,000 in his campaign account when Pierce launched his campaign in spring, 2011 and as of March 2012 had already spent it down to ~$62,000, according to finance reports), name recognition (24 years’ worth), and establishment support–shows that beating Milwaukee incumbents is definitely not out of reach with the right candidate, a smart campaign, and enough endurance, even if it might take a couple of tries. Part of the problem might be the perception that it is impossible, hence few people give it the hard run that is required to make these races truly competitive. If someone who campaigns the way Zielinski does, with the resources he had, is shown to be as vulnerable as he still was at the polls, all of them could be, potentially. None of these politicians are invincible, we just tolerate them sticking around for, in my opinion, far too long. The average council member has been in office for 10 years already, with the longest being there for 23 so far, and he just won another 4. Regular flushing of the pipes is a healthy thing.